I just want to share the fun I’ve had lately – including this anime, Moyashimon Returns. I don’t spend all my time reading tomes of ancient wisdom. (Actually very little of my time, it is just particularly conductive to writing.) This time, something entirely different! While I won’t call myself an otaku, I’ve watched my share of anime over the last decade or so. These Japanese cartoons are far more varied than cartoons here in the west, which are mostly for kids. In Japan they are an important part of youth culture, but many adults also enjoy them. Still, I have felt for some time that the quality of Japanese anime was in terminal decline. Not the technical quality, which has benefited from bringing together handcrafted style and computer animation. Rather, I have felt that the content has more and more become extreme, in a desperate attempt to avoid boredom by going further and further. The breaking of taboos has left any pretense of art and become a competition. For those of us who don’t watch anime to be shocked, there seemed to be less and less to watch for each season. To be honest, I was OK with that – I already have plenty to spend my time on. But this season saw the return of Moyashimon, one of my all-time favorites. This is a college-level edutainment series, featuring a bunch of college freshmen and the bacteria with which they live. Yes, bacteria, and yeast as well. 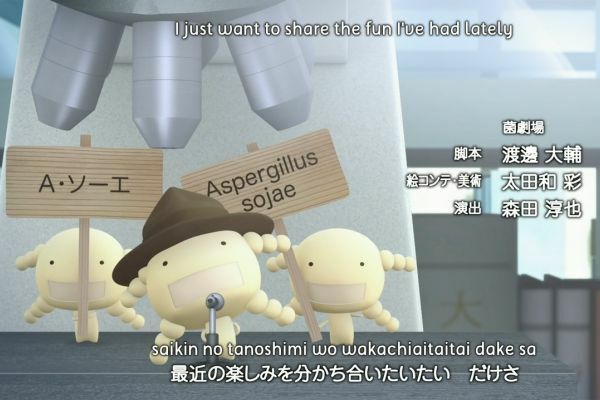 The main character is a boy with the ability to see and talk with bacteria. They appear to him as roughly similar to marshmallows in size and consistency, with a big head shaped roughly like their real shape under the microscope, but more cute and cuddly. None of the others can see the bacteria, but most of his friends know that he can. The microbes also provide running commentary and humorous punchlines. The series teaches about various forms of fermentation and other useful roles of bacteria in our lives, in between the antics of the human cast. Exactly how weird is it? Feel free to watch the Moyashimon Returns ending song on YouTube (until the takedown notice arrives, I guess). It is safe for work, unless your workplace requires sanity. If tales of agriculture are not your major, what about history? One of the most famous periods in Japanese history is the civil wars era where Oda Nabunaga eventually did most of the work to unify Japan, although he died before the process was finished. This “ambition of Oda Nabunaga” is a familiar topic to Japanese, but perhaps less so in the modern age. But this summer a strange new anime has appeared: “The Ambition of Oda Nabuna”, which is a recast of the history of that era, but with cute girls instead of the various warlords. This is sure to renew interest in history among the male viewers! Hopefully it will not feature the enormous massacres on civilians which mar the reputation of the historical Oda Nabunaga. A very bloodless war story is “Dog Days”, which appears with a second season this summer. In the original story, a young school boy from Japan is summoned as a hero to a magical world, where his quick wits and gymnastic skills let him successfully defend his new homeland in war. The wars of that world, however, are completely ceremonial: The defeated soldiers don’t die or even get seriously wounded, instead they are converted to “furballs” for a while, unable to fight. All people in the magical kingdoms are furries: People with animal ears and tails. The country defended by Cinque is populated by dog people, and the ruling princess is addicted to being petted. 0_0 Other kingdoms are ruled by big cats, bunnies, squirrels etc in human form. It is all very cute and colorful, and the battles are beautifully animated. In the second season, the hero returns but brings with him two girls: A rival gymnast who ends up joining another kingdom, and an ordinary and rather scaredy-cat classmate who seems to have a crush on him. By all accounts she is going to turn into a hero of a third nation, although how that transformation is going to happen remains to be seen. I look forward to it. I believe I may have mentioned the original Dog Days under the name “The Cutest War”. I am no big fan of war myself, but the colorful mock battles of Dog Days are a welcome break from the escalation of gore and mayhem in so many recent anime which I cannot recommend or even want to watch for myself. So that’s my summer anime this year. You can watch English translations of anime several places on the Net, but I prefer Crunchyroll, which is a legal anime streaming site that contributes (a little) to the anime industry. It is quite affordable as well, at least by first world standards.